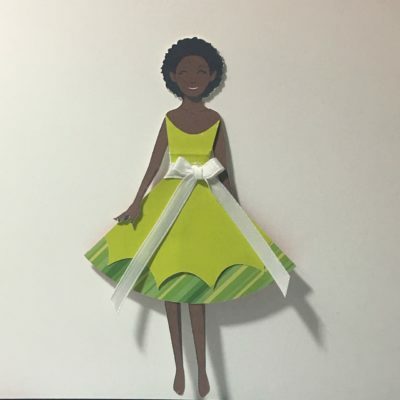 So for our DIY Friday, I went back to my favorite craft of the summer: Paper Doll Dresses. 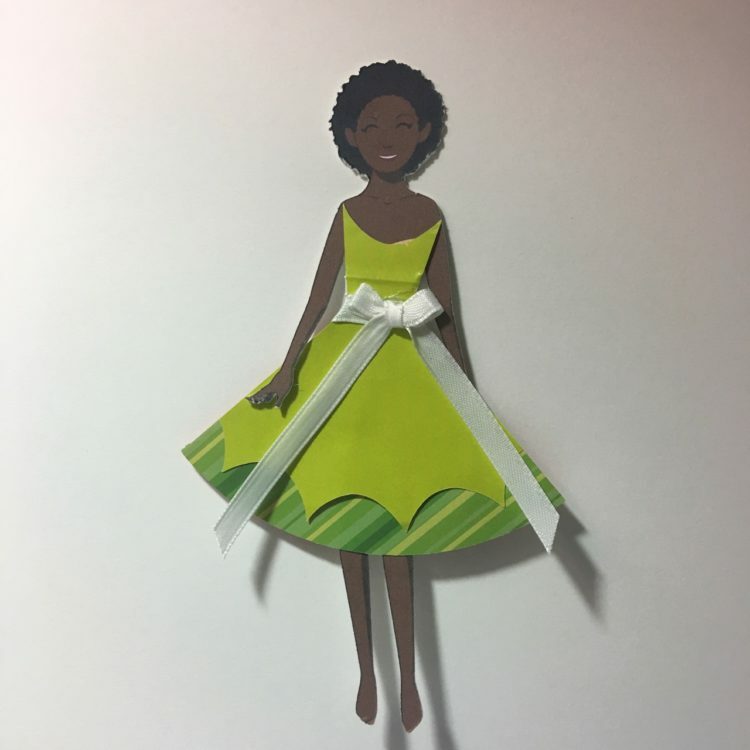 Plus this week was the first week of afterschool classes for the Fall 2018-2019 school year and our first project in the Craft Market class was Paper Doll Dresses’. 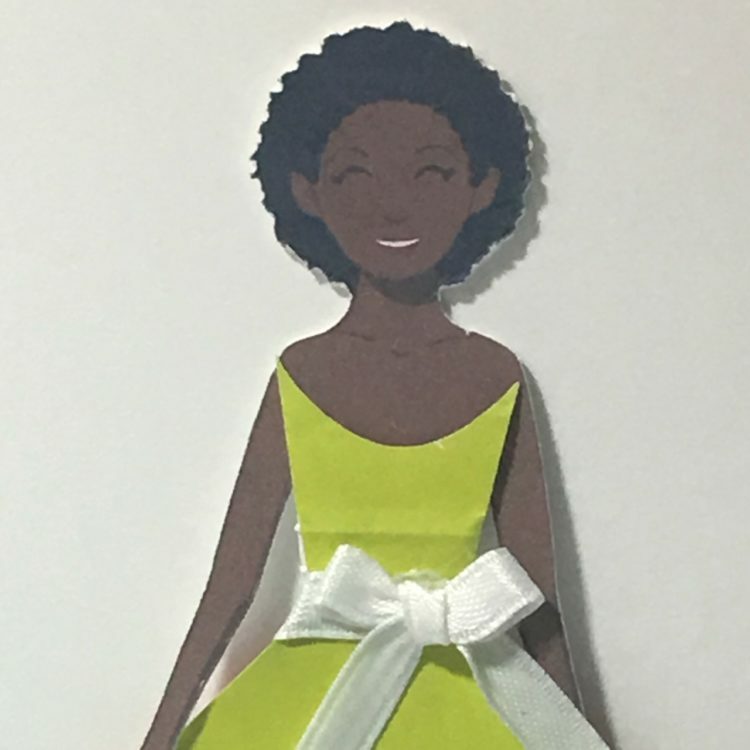 So over the summer, my biggest problem with the dresses was trying to solve how to put them on and take them off the doll. 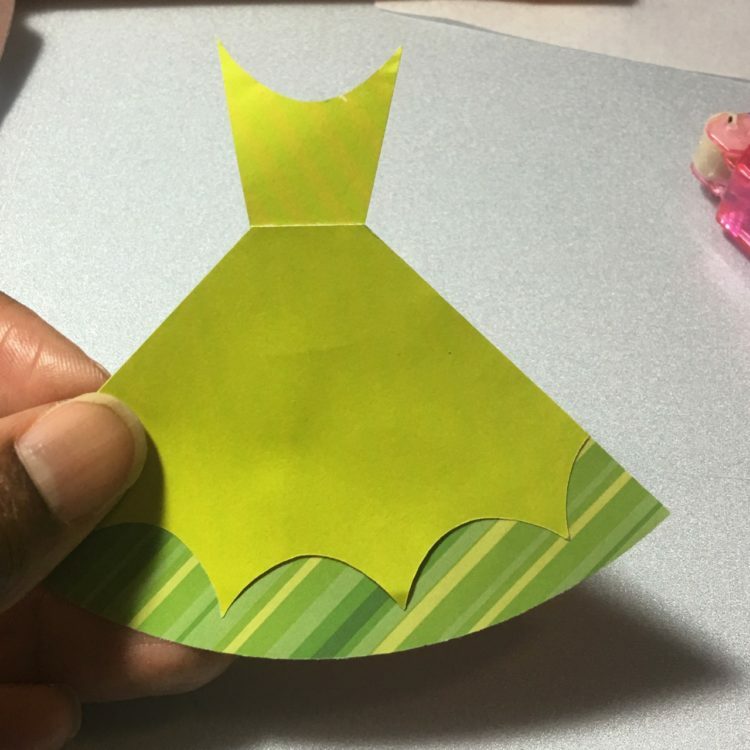 The dresses are made with origami paper and self tabs were not gonna work. So after a lot of research, I came across the tin ties. 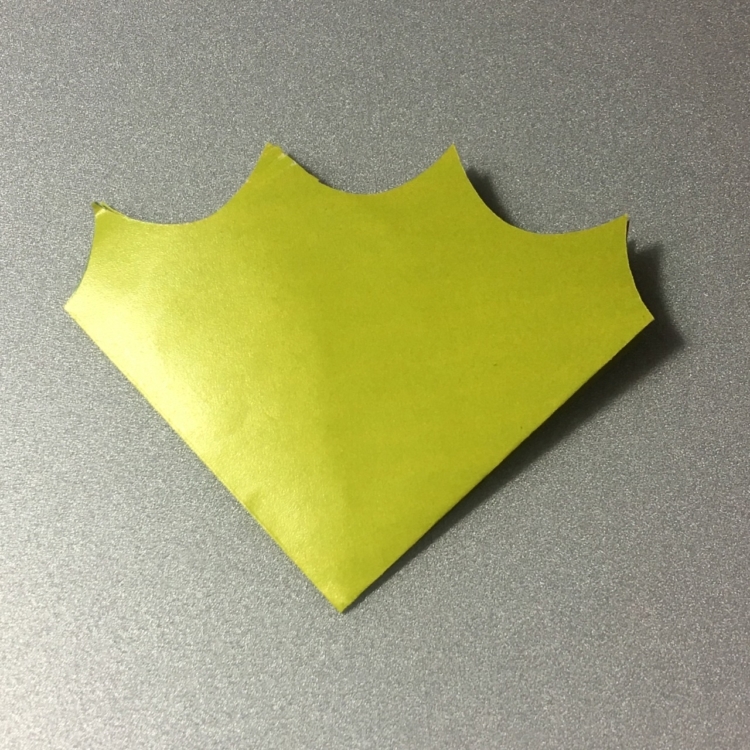 These are the same things you find on coffee bags to keep them closed. I ordered a package from Amazon and experimented with them a little. While I initially liked the idea a lot, I think I will continue to research other options. 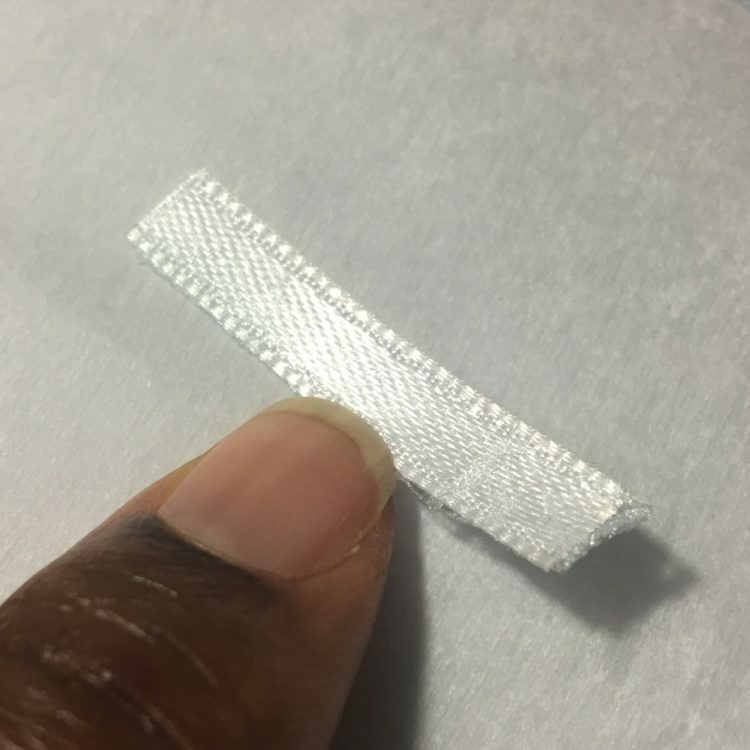 While the tin ties work, when you cut them, the metal wires can separate from the paper. But overall, tin ties work much better than self tabs. And it makes it a lot easier for kids to put the dresses on and off the dolls, multiple times. 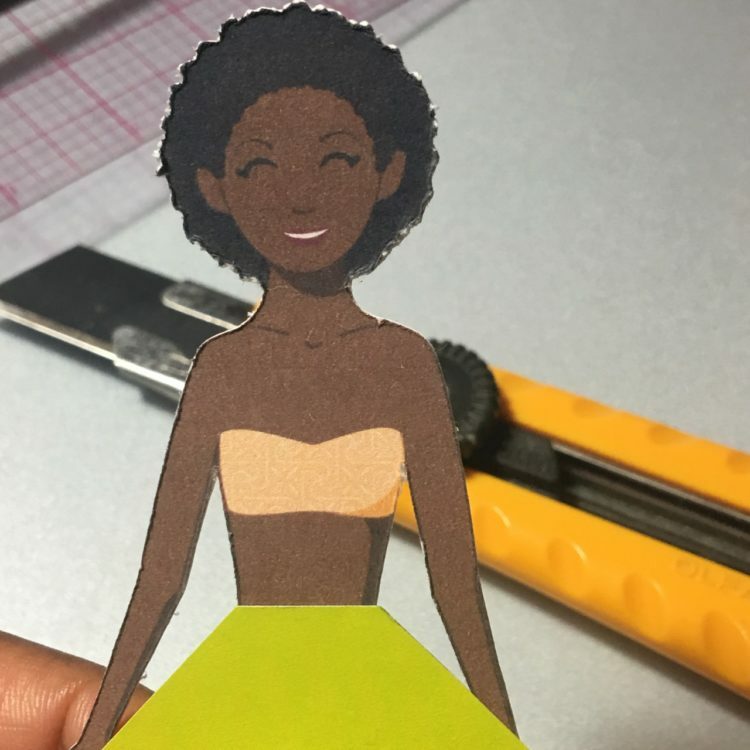 And as always, thanks to Julie Matthews for her wonderful multi ethnic paper dolls. 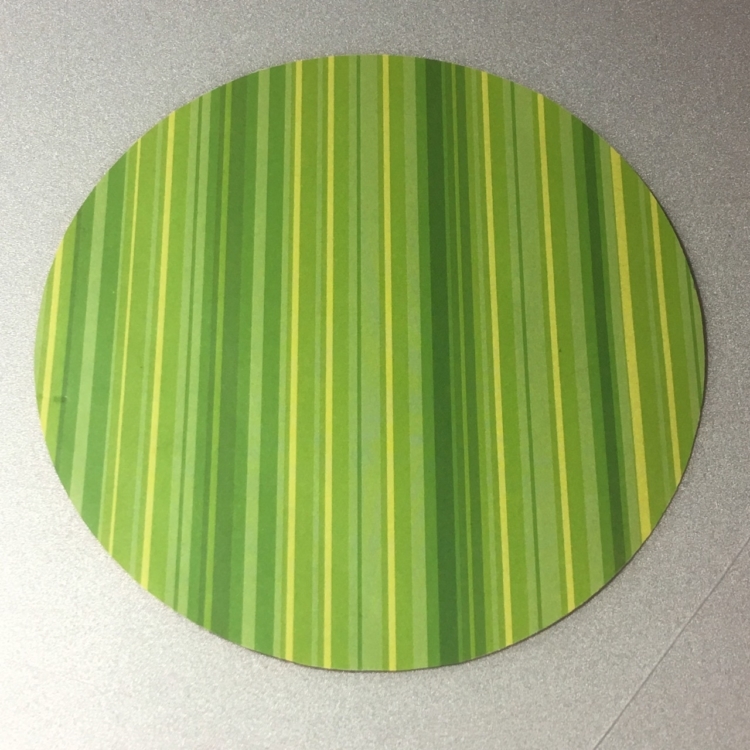 I started with the 5″ circle. 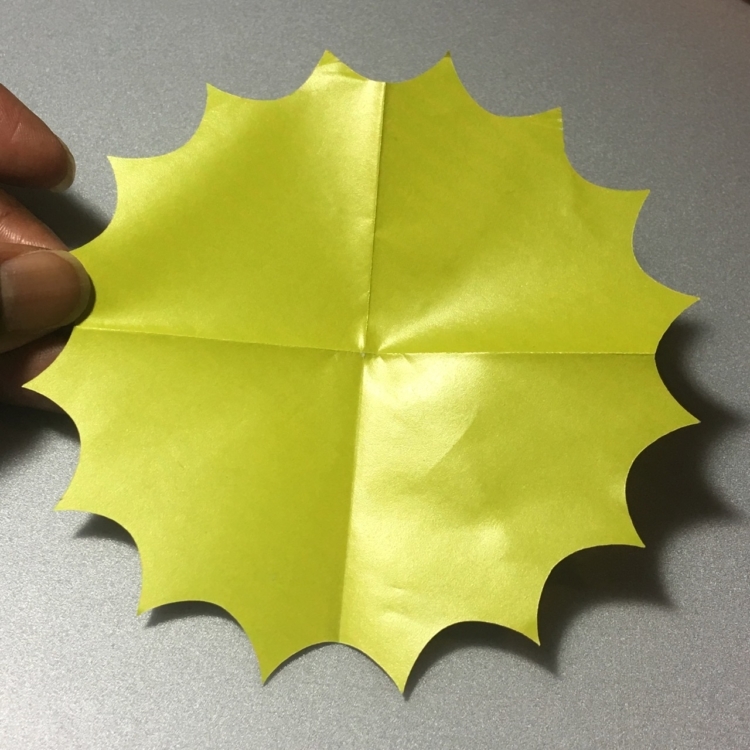 Fold the circle in half making sure the curved edges line up exactly. 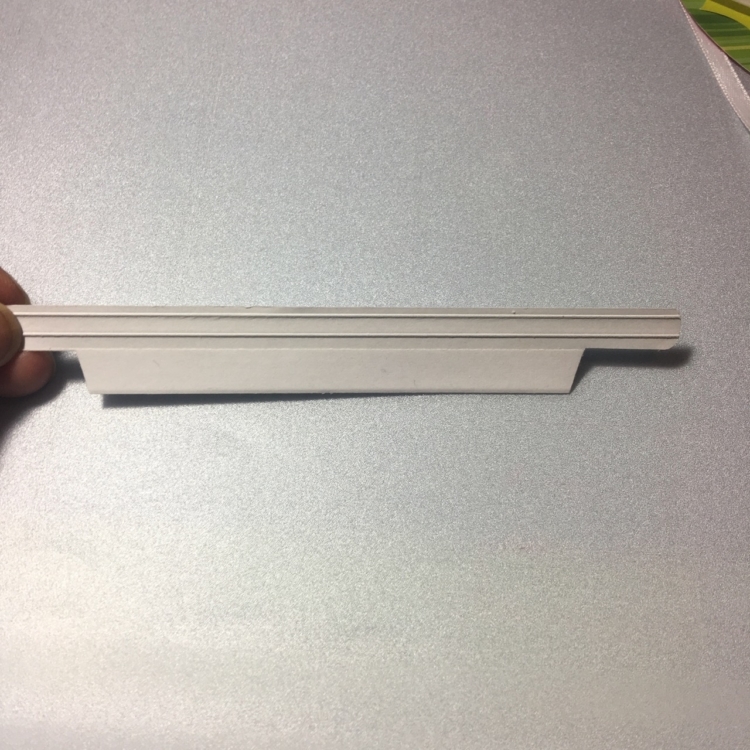 Give the folded edge a sharp crease by running the edged between two finger nails or place the semi circle on the table and run a bone folder over the folded edge. 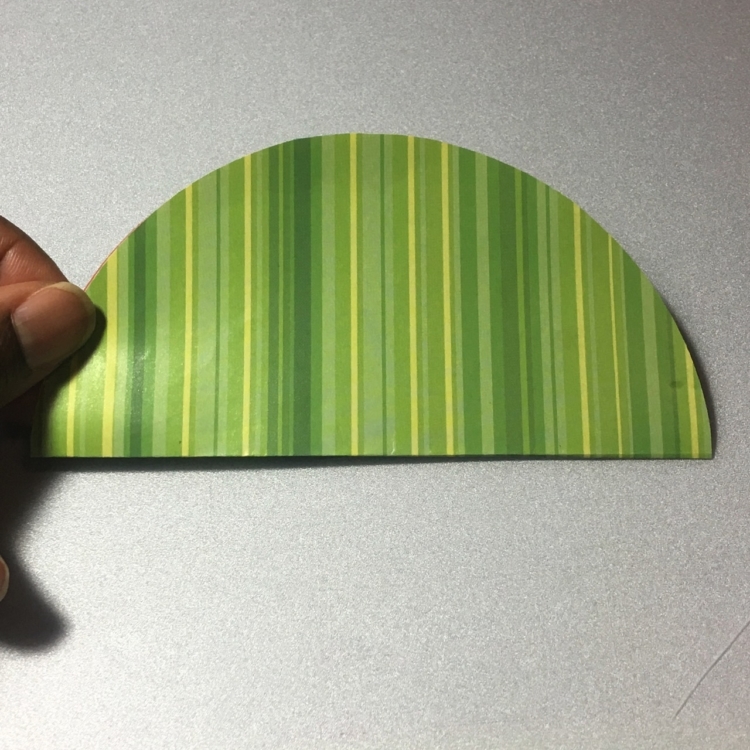 Fold the semi circle into a curved edge right angle triangle. 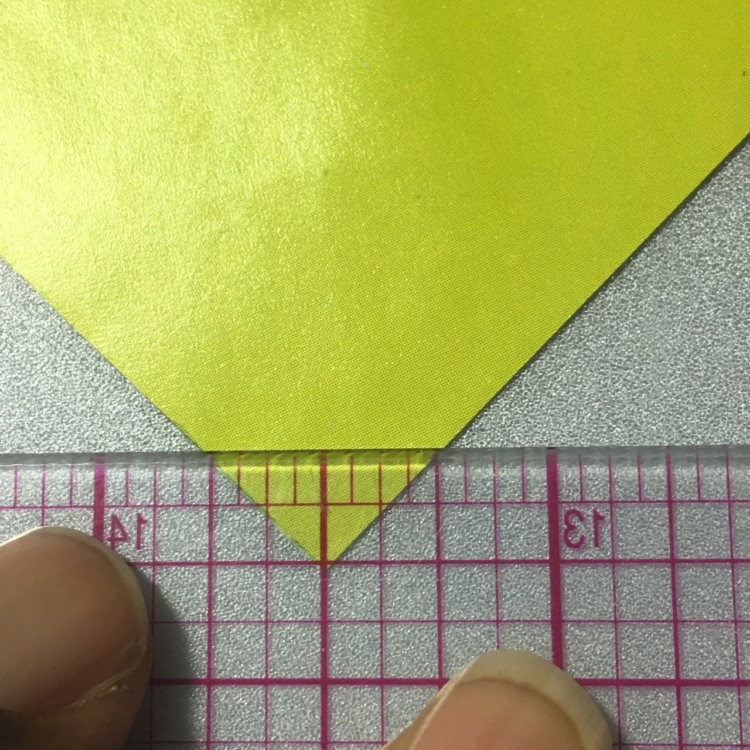 Create a sharp crease on the folded edge. 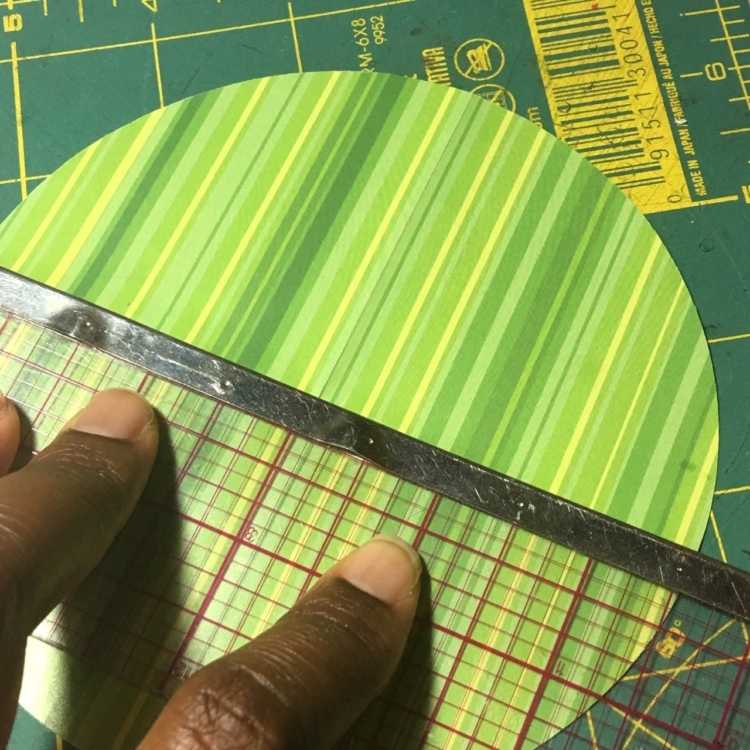 Time to work on the scalloped circle. 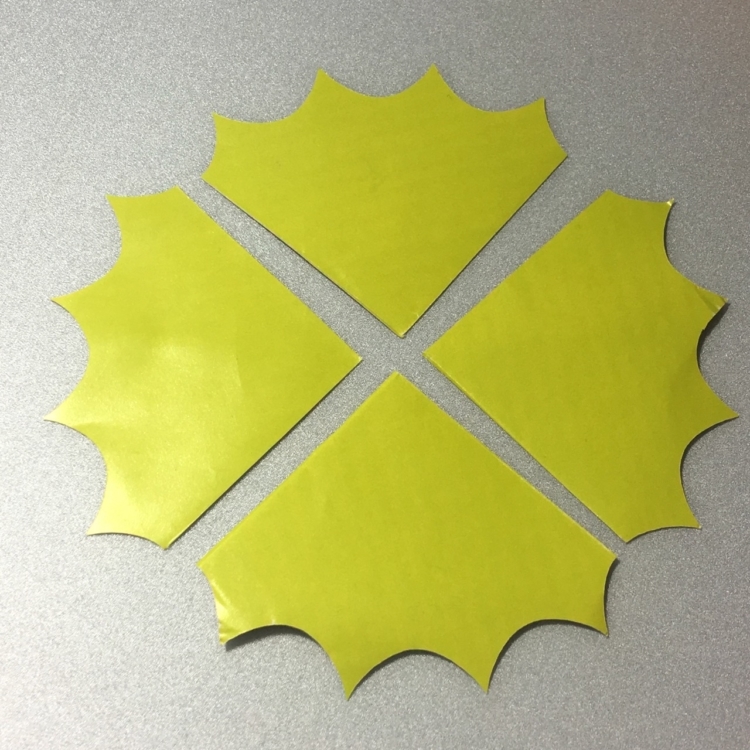 Fold the circle in half so that the fold line is between points of the scallop. 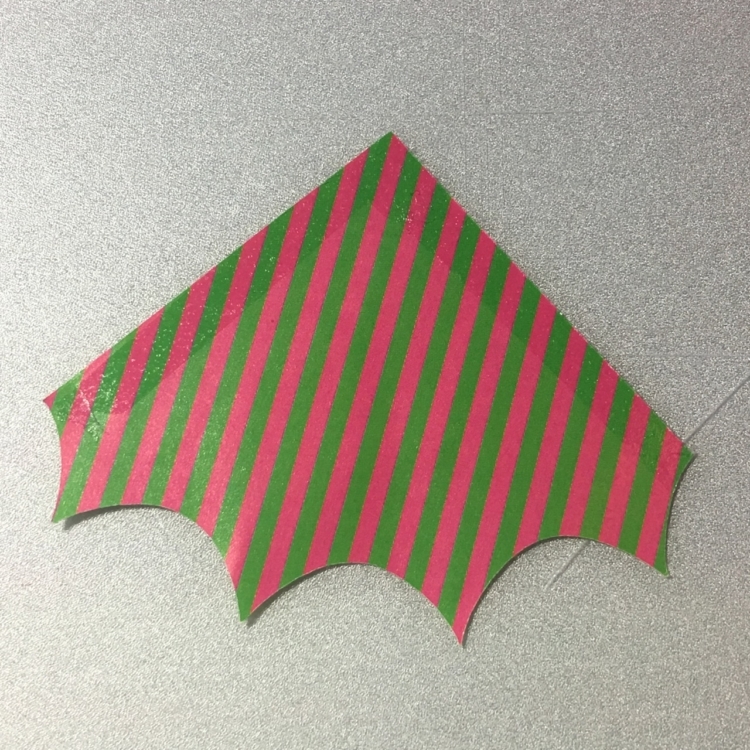 Fold it again in half to create a right angle triangle. 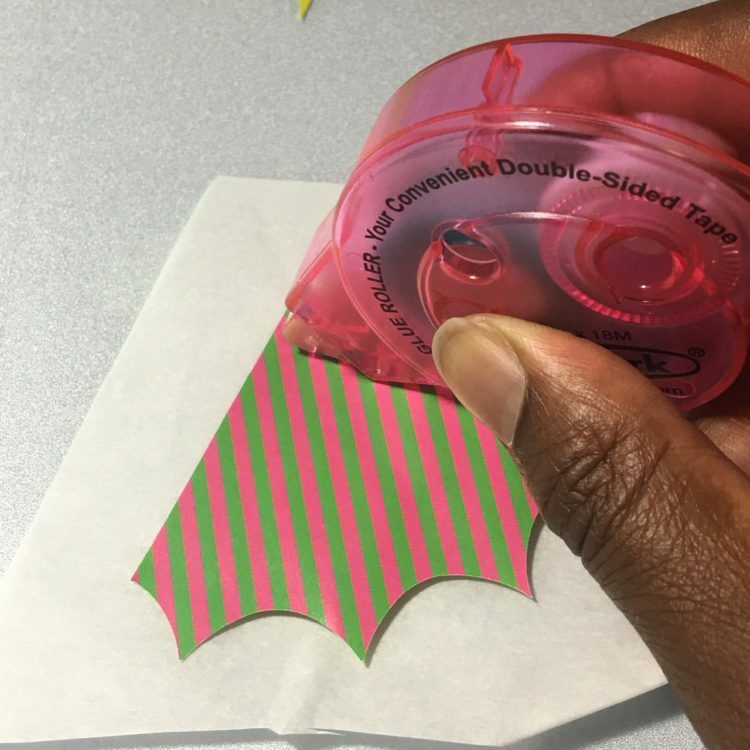 Using a pair of scissors or box cutter, cut along the fold lines. 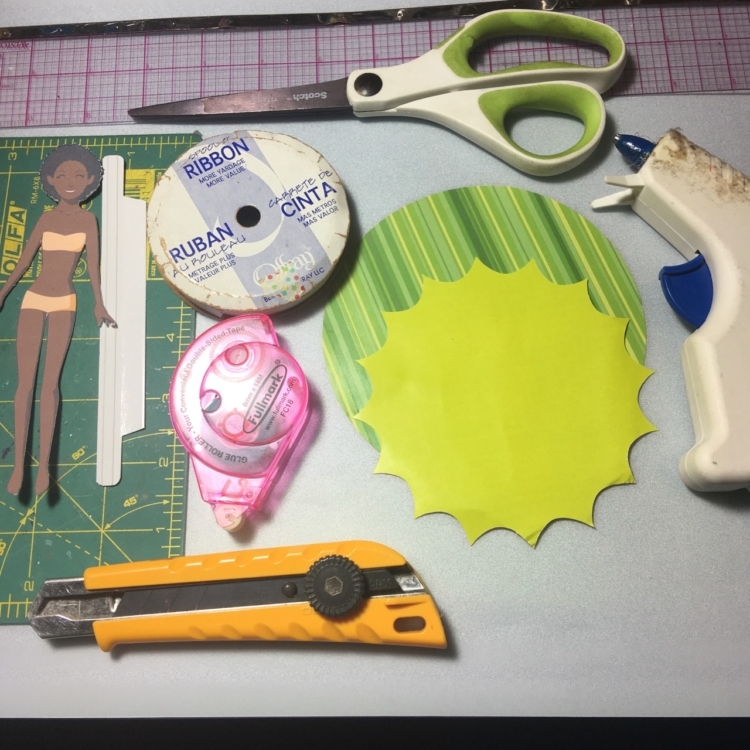 These are the main pieces you will need to make the basic dress. 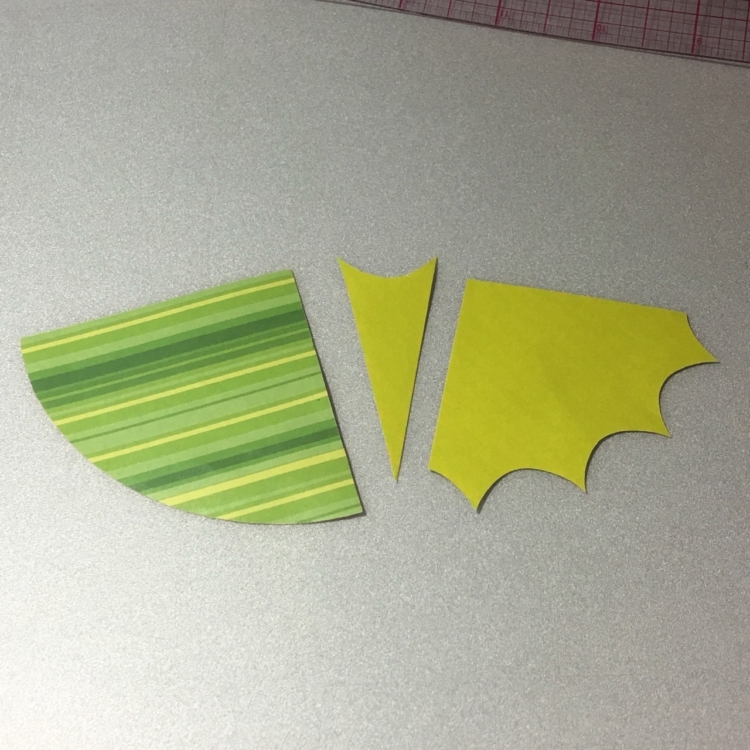 Turn the scalloped triangle up side down and apply the glue on the straight edges. 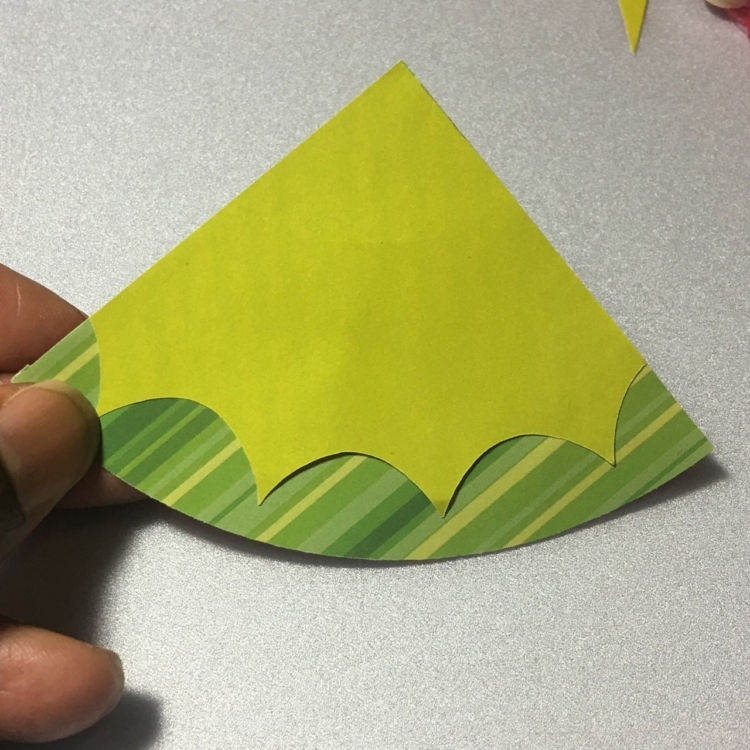 Carefully place the scalloped triangle over the roung edge triangle so that the right angles and the straight edges line up exactly. 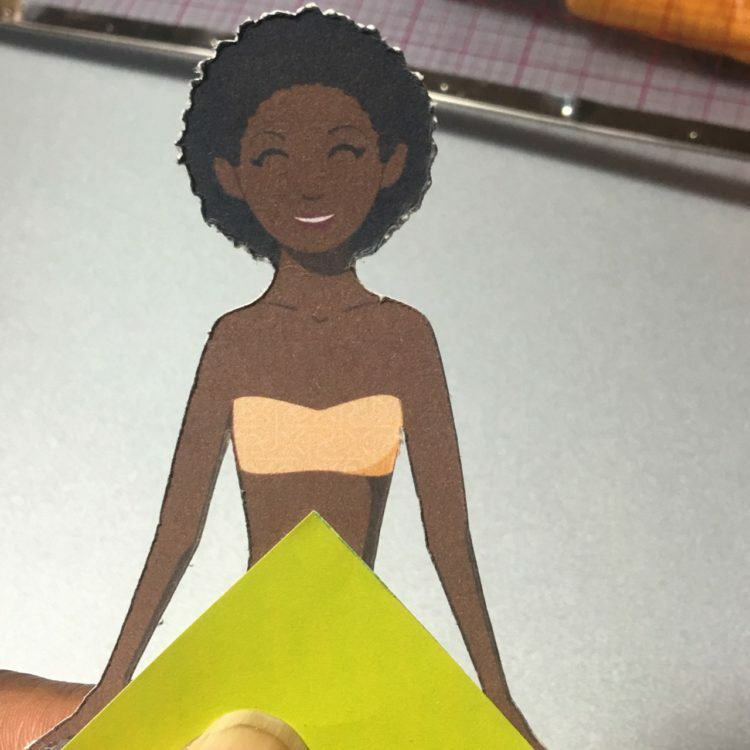 Use your paper doll to determine where to cut the waist line. 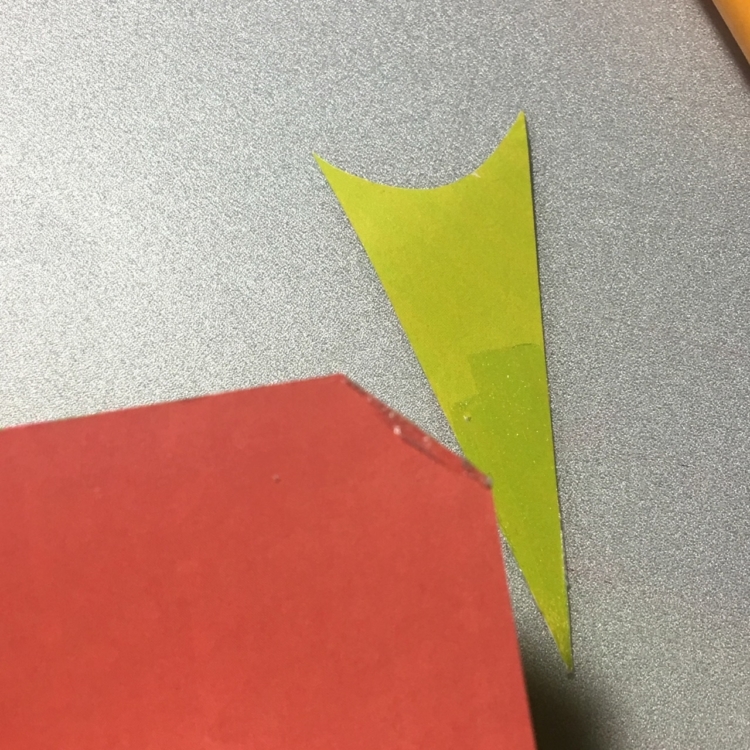 Use a pair of scissors to cut of the tip or as I prefer to do, my handy dandy box cutter. 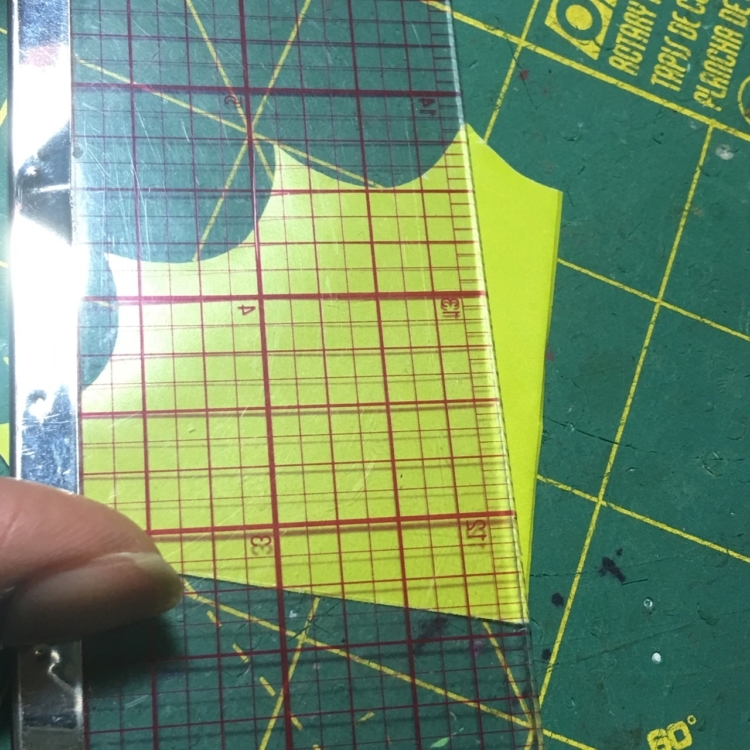 Now to attach the top to the bottom, determine how high the skirt will need to go up the top so that the corners of the waist line up to the edges of the top. 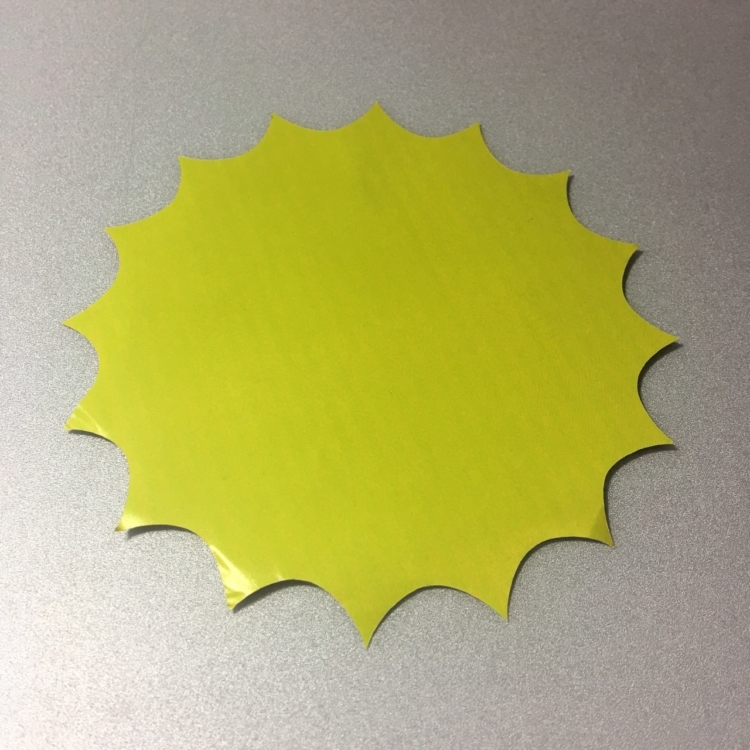 Apply glue to the bottom most tip of the top as well as the edge tip of the bottom, as shown above. Carefully adhere the two pieces together. Set aside. 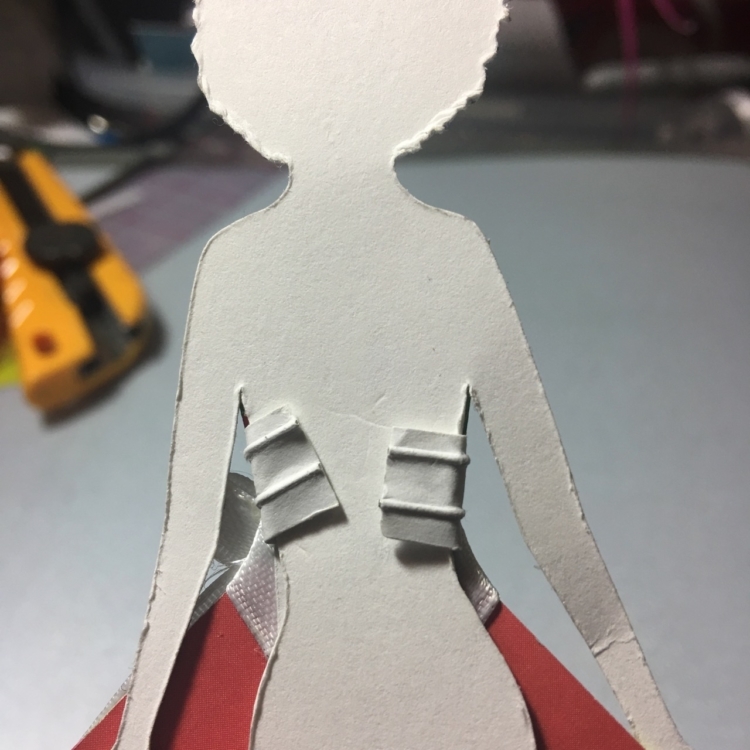 Cut off a piece of ribbon about .5″ bigger than the waist. 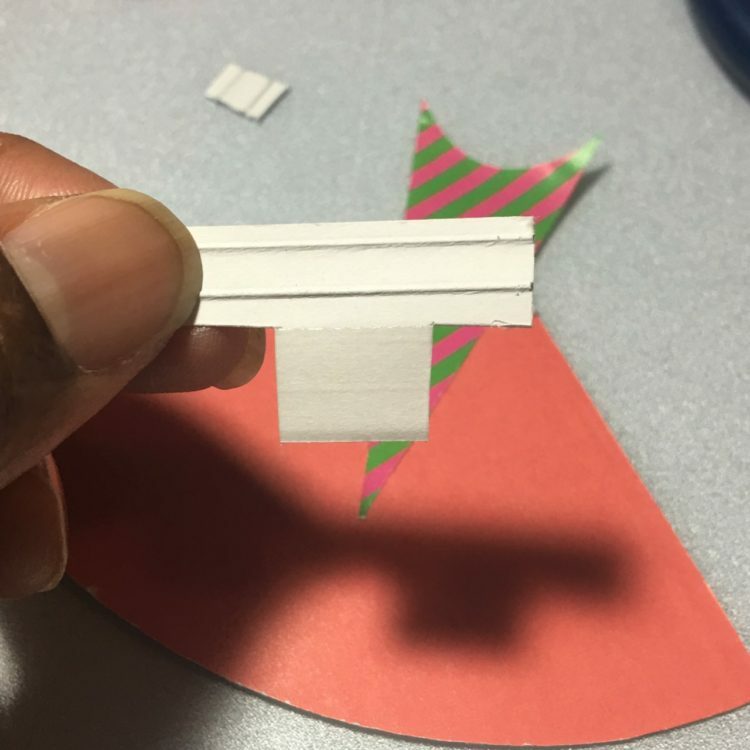 Apply glue to the bottom of the ribbon. This is where I prefer using glue tape as its not wet cos it would seep to the top. 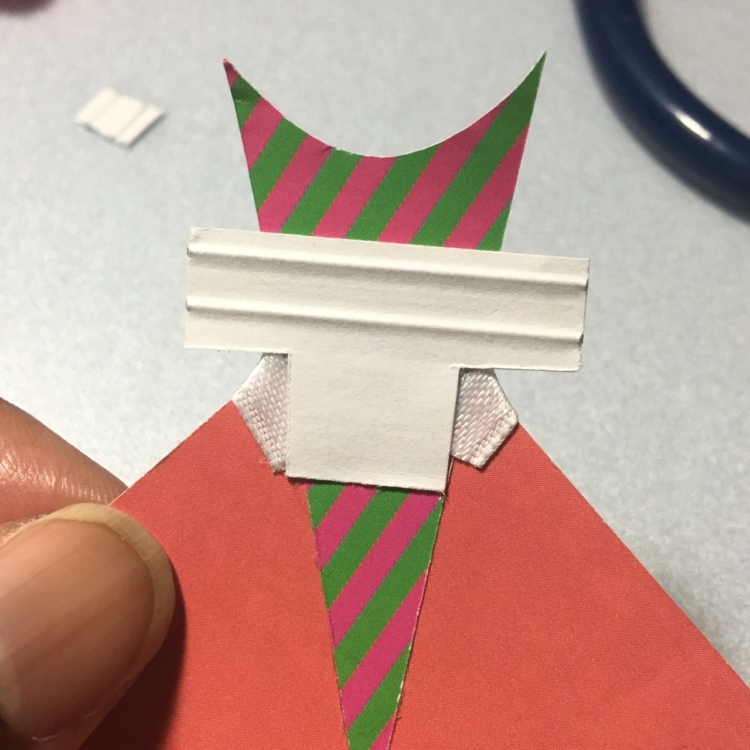 Carefully place the ribbon on the over the waist and press down. 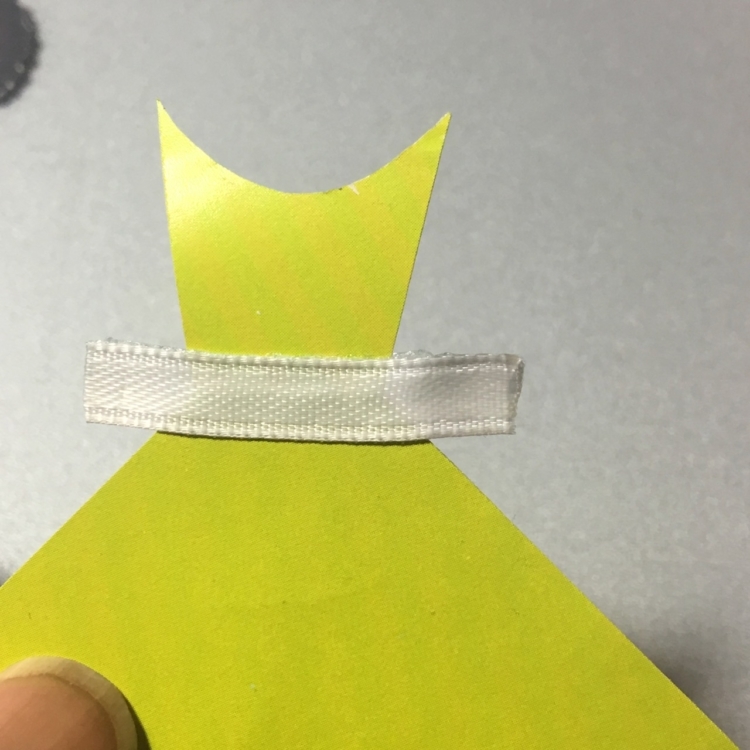 Press the ribbon ends down in the back of the dress. Set aside. 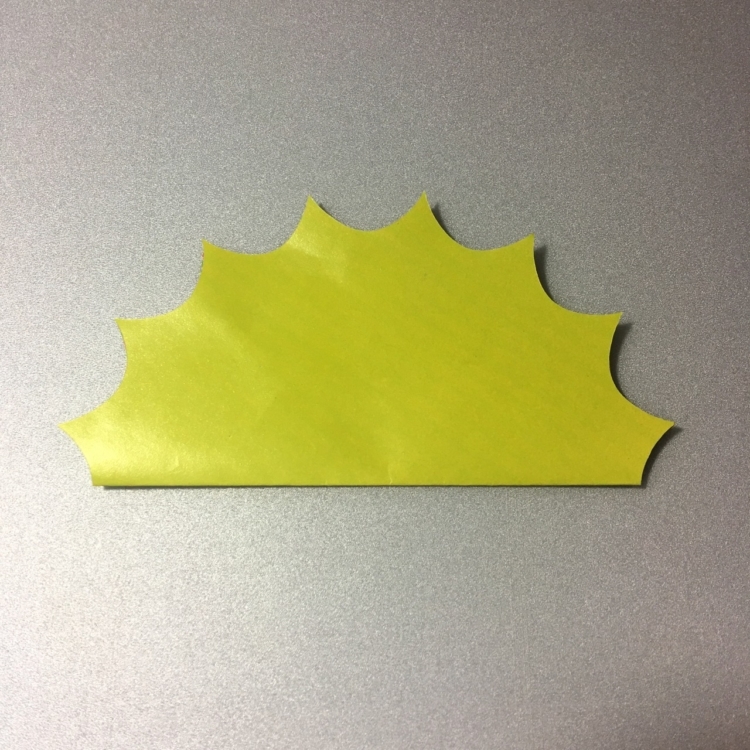 Cut another piece of ribbon about 6″ to 8″ long. 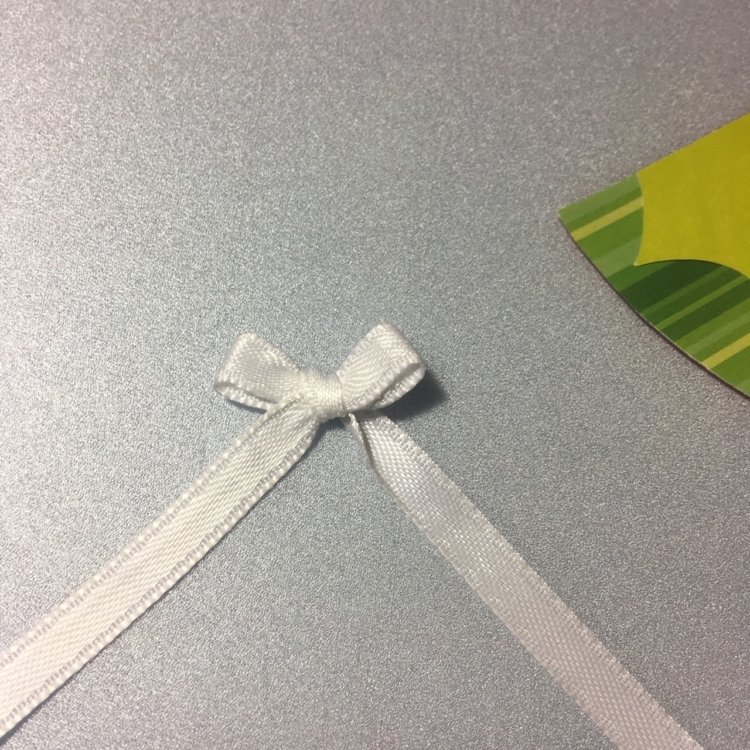 Create a mini ribbon. Set aside. 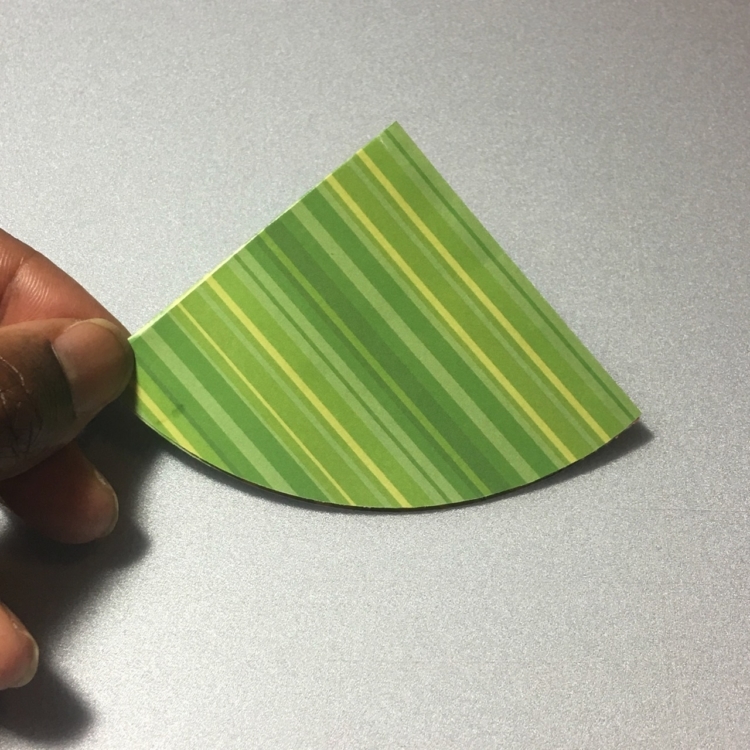 Based on the size of the waist band, cut out the piece you need plus about 1″ extra. 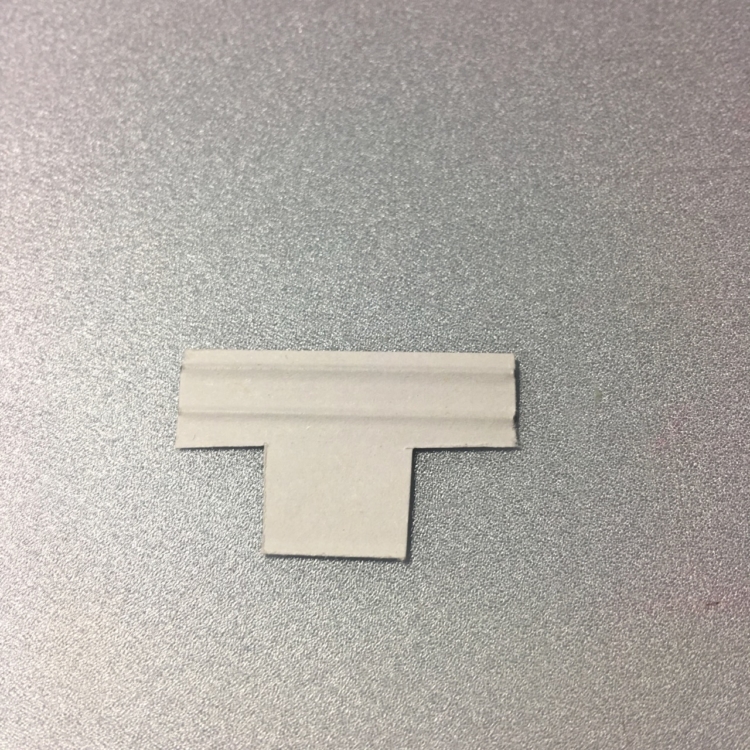 Make sure that the adhesive part is just a hair smaller than the waist size. Place the tin tie centered as shown above. 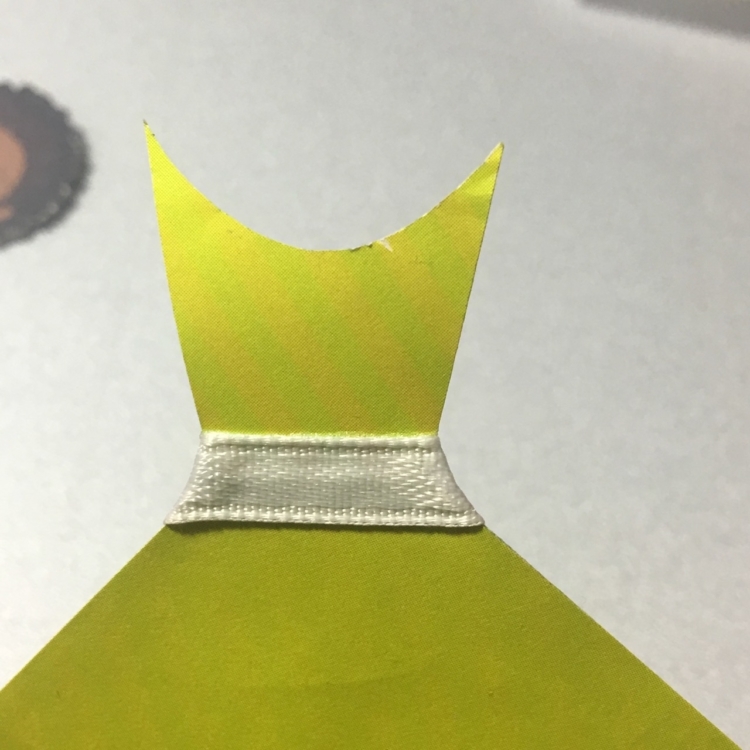 Turn the dress right side up and hot glue the bow asymmetrically. So this is how the dress looks like when placed on the doll.